Progesterone Pure is a pure, hypoallergenic formula free from all synthetic fragrances, emulsifiers, emollients, fillers, alcohol and preservatives. 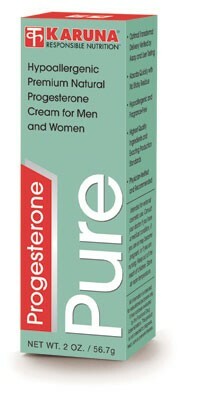 Karuna Progesterone Pure is free of alcohol, parabens and urea. Each 2 oz. tube is standardized, quality-controlled and safety-sealed to prevent oxidation and bacterial contamination.